Hope for Tomorrow is a national charity dedicated to bringing cancer treatment to rural areas. 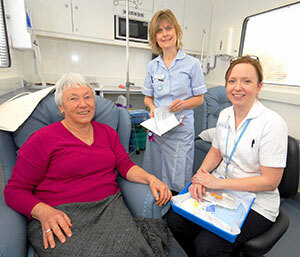 Mobile Chemotherapy Units bring vital chemotherapy treatment closer to patient’s homes, reducing long distances of travel, waiting times and help avoid the stresses and strains of busy Oncology Centres. The charity was launched in 2003 by Christine Mills, who lost her husband David to cancer. 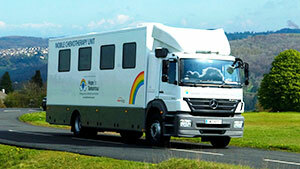 By 2007 it had launched the world’s first Mobile Chemotherapy Unit in a unique partnership with the NHS. Provided and maintained by the charity and operated by highly trained NHS staff, these well- equipped units allow cancer patients to receive treatment in a restful environment closer to home. Mobile Chemotherapy Units can travel five days a week throughout their counties of operation to five set locations and have the capacity to treat up to 20 patients a day. Currently four Mobile Chemotherapy Units are operating in Gloucestershire, Somerset, Wiltshire, Hampshire, Dorset and East Kent. The sixth and seventh units will be allocated to Berkshire and Lincolnshire NHS Foundation Trusts. At the end of 2013, 6,000 treatments had been given and 240,000 miles of travel saved. The charity’s mission is to deliver quality of treatment, which is locally available, with dignity for patients during their treatment, to give them hope for tomorrow. 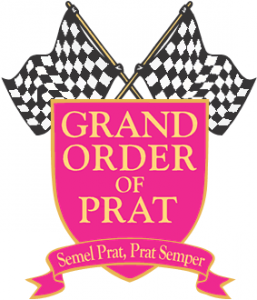 The Grand Order of PRAT is a fundraising activity within FIAG. The Pennington Ridiculous Award Trophy (PRAT) will be awarded annually to an individual or group who raises the most funds for the Hope for Tomorrow charity. For over 20 years Jack Pennington (a member of the Cartoonist Club of Great Britain) produced, for Fleet Support Group, a calendar containing caricatures of customers and staff. Many of these calendars are classic with regard to their content. Jack’s talent enabled him to identify certain aspects of the fleet industry and then present them humorously using the caricatures. Sadly, in 2006, Jack lost a long battle with cancer and it was decided, in recognition of his considerable contribution, that a humorous annual award trophy would be created. The result: The Pennington Ridiculous Award Trophy. In 2007 the first PRAT awards were made. There are now over 30 recognised PRATs, all of whom are recorded for posterity in the PRAT Hall of Fame.